One major limb cracked off a few years ago, a wound from Hurricane Irene. Another was pulled off by a truck that was too tall and wide for the roadway. 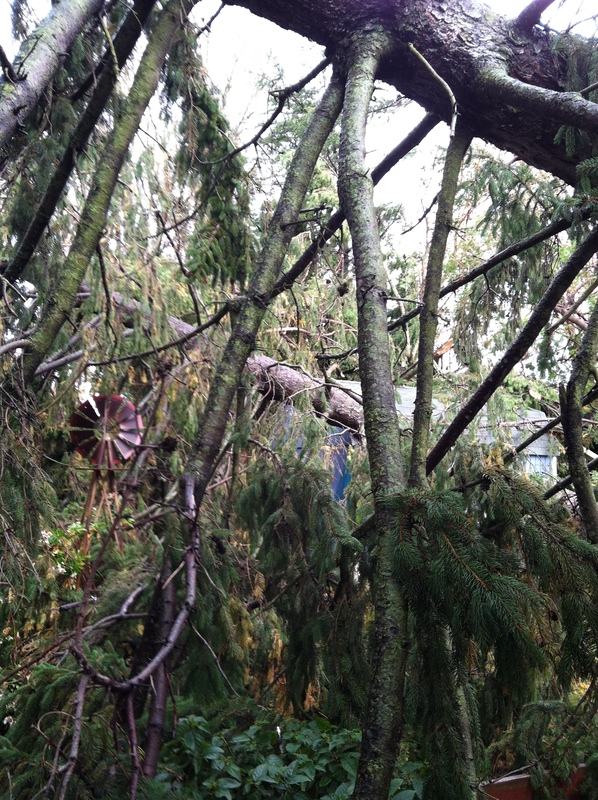 And now one of its last remaining large limbs has come down, thanks to Sandy. But the tree still holds on, no matter what man or nature have hurled at it. And this week, nature has hurled an awful lot at our trees. And at us. 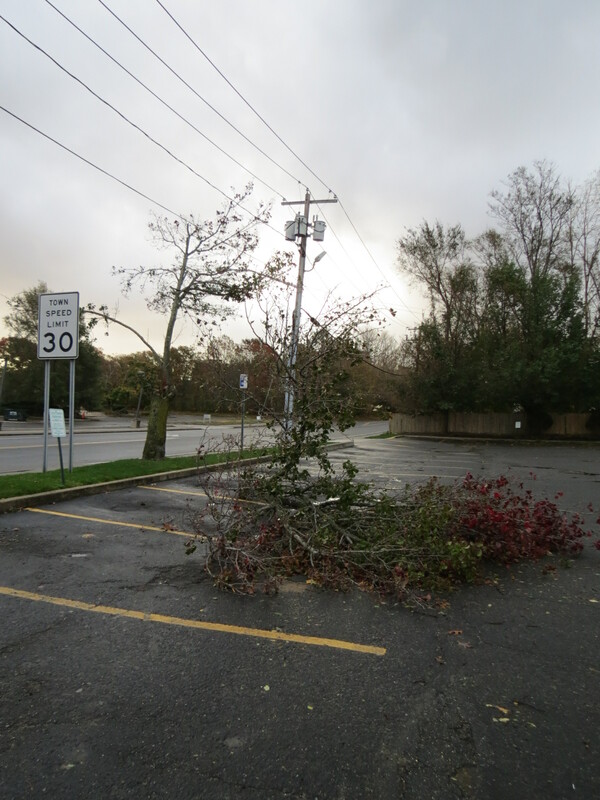 On a recent drive to my parents house to get my own glimpse of the trees that are resting on the roof of their house, I could not help but look out of the car window at all of the other trees that toppled over as a result of Sandy. This is what I learned. Bradford Pears were a huge casualty, probably because of their tightly packed leaves and branches and soft wood. Perhaps we need to loosen up and toughen up. Waiting for gas, part 1. Life may not return to normal for a long time, and services cannot be started immediately. Recovery is a process — whether it’s recovery from an addiction or recovery from a tragedy — and the process will go at its own pace regardless of our wishes. This idea recently occurred to my neighbor, who is still without power. Since he is the only house in the neighborhood, it may be some time before the power company even arrives at his house — it’s a reality that he has come to accept. And although he would like to have the convenience of his life back, he admits that there is something nice about not having power. His family is playing games and talking — and not retreating to their electronic world in their individual bedrooms. Maybe — just maybe — we should take the time to unplug, especially after life returns to normal. The oaks either cracked or toppled completely, probably because of their unwillingness to bend. We need to be flexible and less rigid during this time. It will help ease some of the post-hurricane stresses, which are now just starting to bubble. Without flexibility, we may snap — and what good is that? Waiting for gas, part 2. 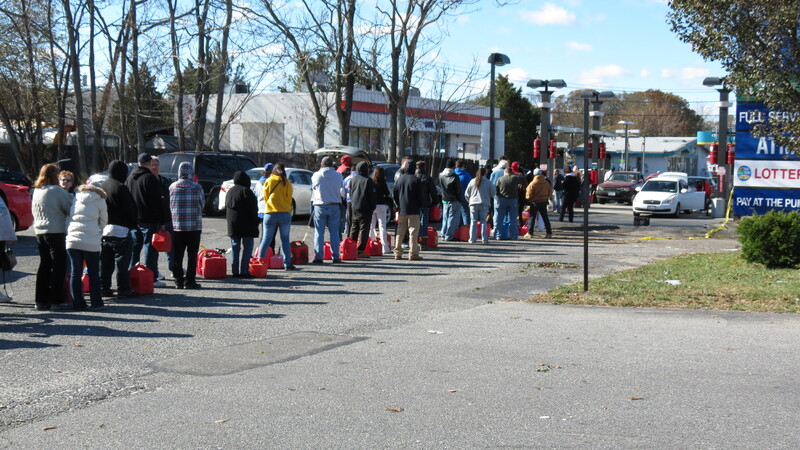 In a scene right out of The Hunger Games, homeowners and drivers are lining up for hours for gasoline in order to power their generators and cars. Some areas are even rationing gas. There is a shortage of sorts — partly due to NY Harbor being closed (and now reopened) and power issues at various fuel terminals. Police and attendants are manning the gas stations to maintain order — because nerves are fraying. For me, it means not driving. I’m staying local and doing a lot of walking and conserving the gas in my car for when my job resumes — and when it does, I will carpool. 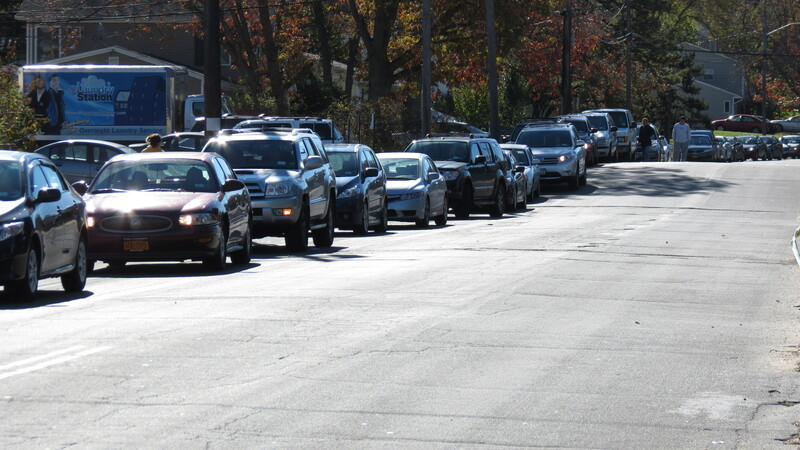 The gas shortage is temporary — and patience (a word that many of us may longer know) is a necessity. So many pines came down — I think because of their shallow roots. Ironic isn’t it — that a plant with the word “ever” in its name should have shallow roots? That a tree so many of us count on for year-round greenery could be so quick to leave? Some people have said they want to leave, that they never want to experience this again — but the truth is, our roots run deeper than an evergreen. Those roots are necessary for many of these communities to rebuild and survive — and I do hope people will rethink their decision to leave. It’s because of people — not trees — that each of these communities has its own flavor. It makes Breezy Point different from Seaside, which is different than Long Beach, which is . . . You get the picture. I also noticed that the majority of trees that fell were the trees that stood alone, the trees that — for whatever reasons — grew away from the clumps of wooded areas. Since Sandy, overnight temperatures are dipping into the 30s and a Nor’easter, which is essentially a cold weather tropical storm, is forecasted for later this week. Now, more than ever, we need one another for support. We need one another for strength. We need one another for protection and shelter and comfort. We need one another to be a community. If we stand alone, we’ll fall over. Together, we have a chance. If you would like to help in the recovery process, donations can be made to the American Red Cross. Thanks so much. Hope all is well in your part of the world — things are slow (for so many reasons) around here. We certainly can learn a lot from nature. I agree. Together, we have a chance. All the best! I’m sorry you are having to go through this. In 2004, North Florida was hit with 3 hurricanes very close together. I went a week without electricity but I don’t think it was anything like what you are experiencing. I have been very fortunate throughout Sandy. But there are so many people along our coasts who are really suffering — and when the chips are down, it seems that services are taking forever to return. So many of them are cut off from any news and information. We’re all hopeful that things will start to move in a positive direction very soon. I really found what you’ve shared to be applicable to us all. I speak a lot about resilience because I see it as a quality we just must develop. I don’t think we’re born with it, and I think sometimes we refuse to bend and miss out on the opportunity to develop qualities that would enhance our lives. I don’t need to say more…you’ve said it best. Hello Debra. Resilience is an interesting concept and I wonder if it can be taught or cultivated. It certainly comes in handy when needed. Great post. I hope everyone affected can get through the next few day – or weeks – well. Patience, flexibility, and standing together. Good things to have no matter where we are. I’m glad you enjoyed the post. You’re right — those three ideas can get us a long way, no matter the weather. This post is so wise. We think of trees are bastions of strength but even the mighty fall. Nature is the best teacher and we will always be her students. It’s only those not open enough to listen who miss the lesson. I’m so glad you and your parents are ok. Many thanks for the warm thoughts. Interesting times around here. . . Thank you for this beautiful post. I see what is happening on television, but to hear your account makes it more real. Storms are meant to cleanse. The infrastructure of our life make this cleansing very painful. Though you have shown in this post that by changing how you look at things, the things you look at change. I wish you well in your journey to whatever lies ahead. Hi Mary. Like I said in the previous comment, things are interesting around here. According to the news coverage, tempers are starting to bubble as some communities are feeling cut off from the world and neglected in the recovery process. I do believe, though, that the power crews (which have come from as far away as California and Canada) are working as fast as they can — it’s just that the task is so monumental. I’ll try to keep people posted. Beautiful and thoughtful as usual. I always look forward to reading your posts. Hi Heather. Thanks for your kind words. We’re all trying to stay positive through this storm and its aftermath — of not for ourselves, then for one another. What a wonderful way to express what we need during a tragedy like Sandy. Hi Diane. The odds are stacked against so any people — flooding, wind, lack of power, homes washed away, no heat, looters, and now a very cold nor’easter. With each passing day, it’s important to find hope — even from a tree.